DUP deputy leader Nigel Dodds speaking in the House of Commons on Tuesday. Photo credit: PA Wire. 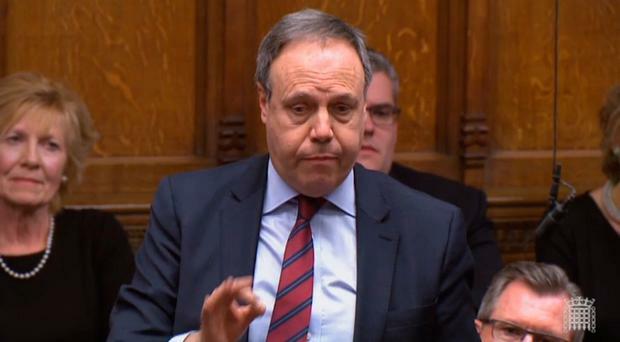 DUP deputy leader Nigel Dodds has reacted angrily to claims that an amendment to Prime Minister Theresa May's Brexit deal has effectively "ripped up the Good Friday Agreement". The SNP's Westminster leader Ian Blackford made the claim after MPs passed an amendment saying they would support Mrs May's Brexit withdrawal deal if the controversial backstop plan was replaced with "alternative arrangements". The backstop plan, aiming to prevent a hard border on the island of Ireland, has been opposed by the DUP who say it would create a trade border in the Irish Sea and could leave Northern Ireland tied to the EU indefinetly. Tory party Brexiteers also opposed the plan, saying it did not deliver on Brexit promises. The EU and Irish government have been adamant that Mrs May's withdrawal deal cannot be renegotiated and have rejected the possibility of changing the backstop plan. Speaking in the House of Commons after the vote on Tuesday night, Mr Blackford said the amendment had "ripped up the Good Friday Agreement"
"We were told the backstop was there to protect the peace process but tonight the Conservative Party has effectively ripped apart the Good Friday Agreement. This House should be ashamed of itself," he said. "It is outrageous... to say that this vote drives a coach and horses through the Good Friday Agreement"
However, North Belfast MP Dodds quickly rebuked the claims, saying they were "utterly reckless". The DUP deputy leader said he was speaking on "behalf of both communities in Northern Ireland". "To say that this vote tonight drives a coach and horses through the Good Friday Agreement, it does nothing of the sort," he said. "It is utterly reckless to talk in those terms. The fact of the matter is, that nobody in Northern Ireland, no political party is advocating any kind of hard border on the island of Ireland and we certainly do not advocate what others advocate which is creating borders within the United Kingdom or breaking up the United Kingdom. "This is a significant night because for the first time the House by majority has expressed what sort of deal will get through and will have a majority, and we will work with the Prime Minister to deliver the right deal for the United Kingdom." SDLP leader Colum Eastwood described the vote as an "affront on the Good Friday Agreement". "Tonight, London decided that the interests of the people in Northern Ireland were secondary to the needs of the Conservative Party," the Foyle MLA said. "Let me be clear, the people of Northern Ireland did not consent to this. We will continue to engage with the Irish Government to ensure that the Backstop, as reiterated by Brussels, will not be undermined in the slightest."